I am very happy to say that I got as far as getting gears 1 thru 7 on my back wheel working after replacing my wheel (for the very first time). Now I have one small problem. Each click moves the chain by one gear beautifully but to get into the lowest gear (largest sprocket) I have to go beyond the last notch and really yank on the twist grip shifter. Sometimes it stays there, sometimes it does not. Conversely when I shift all the way to the smallest gear I have an extra click while it stays in that highest gear. I have been playing around way to much with the "H" and "L" screws. Is it possible that I need to either tighten or loosen the cable itself to get synced up? I have the cable pretty tight but I think it would be possible to get it tighter. Yes. It says "Cera Shimano" on it. they put gripshift with shimano all the time, but I think the ratio is off abit. You just need to tighten up the cable to get the derailleur to move on that first click. The H and L screws are probably not the issue. These are set to stop the movement of the derailleur from going beyond the innermost and outermost cog regardless of cable tension. 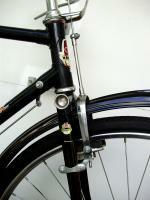 for with a relaxed derailluer sets the ratio for all other shifts. it is the most important setting. so what he needs to find is his optimum starting point. which is what I tried to convey.Rule number 1 do not mix brands of shifters, cogs, derailluers,chains just because manufacturers do it does not always make a perfect ride. I hear what you're saying about gripshift, but they are mixed with shimano drivetrains on millions of bikes and work reasonably well. I think the problem with them is that they use a lot of plastic and have a ratchet system that allows for a lot of play. Although the ratio is correct, the shifters don't lock into the right position very well. I don't want to get into some big argument over it. But I want to disagree with what I think you are saying about the limit (H & L) screws because this seems to be a common misconception. The limit screws just set the end points of how far the derailleur can move at either extreme. They set the inner and outer "limit" of movement. They have zero effect on how the derailleur moves between the individual gears and the don't affect "the ratio for all other shifts". That is purely controlled by the cable tension. I think this confuses people because at the highest and lowest gear the limit screws can mess up the ability of the derailleur to go into those gears properly. If a limit screw is too far in, it will stop the chain from shifting into the innermost or outermost gear, even if the cable tension is set correctly. Conversely, sometimes people think their limits are set right because the derailleur sits in the right place under the inner and outer cog. Actually it may be that the derailleur sits in the right place because the tension is adjusted right, but the limits are too far out and if you force the shifter you can get the derailleur to move beyond it's proper range. Apologies if I'm misunderstanding you. I just see a lot of people saying "it won't shift between gear 3 and 4 so I'm playing with the limit screws" which will have zero effect. bad advice, just tried to give a quick step by step that might help. I do not even know he has ever even worked on a bike before.